Join Symphony NH for an Irish Christmas featuring the songs, stories, and dance music of Ireland and its Celtic influences around the world, all in celebration of the holiday season. Click below to hear Ciarán Nagle and Tara Novak with Ishna performing at Irishfest Boston. Recipient of a prestigious Irish Research Council Scholarship, Ciarán Crilly served as Principal Guest Conductor of the Dublin Symphony Orchestra and as founding conductor of the Orchestra of the Irish National Youth Ballet. | Click here to read Ciarán Crilly's full bio. Ciarán is Artistic Director of the UCD Symphony Orchestra, Artistic Director of the UCD Ad Astra Academy for the Performing Arts (Music), and Assistant Professor of Orchestral Conducting in the UCD School of Music, where he teaches courses on performance, analysis and modernism. He was Principal Guest Conductor of the Dublin Symphony Orchestra (2003-06), Principal Conductor of the Dublin Orchestral Players (2007-15), and founding conductor of the Orchestra of the Irish National Youth Ballet. He is Director of the Orchestral Manoeuvres summer course at the Royal Irish Academy of Music and oversees conducting activities on the world-renowned MA in Scoring for Film and Visual Media at Pulse College. Other conducting experience includes concerts/recordings with the Dublin Screen Orchestra, Savaria Symphony Orchestra, Miró Chamber Orchestra, Baden Sinfonietta, Dublin County Choir, Mornington Singers, Mannheim Uniorchester, EAR Ensemble, Hibernian Orchestra, Irish Film Orchestra, RTÉ Concert Orchestra, Dublin Baroque Players & RIAM Symphony Orchestra. Ciarán holds degrees from King's College London (BMus), Goldsmiths, University of London (MA) and University College Dublin (PhD), studying violin at the Guildhall School of Music and Drama and orchestral conducting at the Prague Conservatory of Music. He has participated in conducting master classes and competitions throughout Europe, including the 2005 Cadaqués Orchestra International Conducting Competition and the 2006 Besancon International Competition for Young Conductors (Highly Commended). As a violinist and violist, he has also worked with the RTÉ Concert Orchestra, Irish Film Orchestra, Orlando Chamber Orchestra, Marlborough Baroque, Irish Sinfonia, and was a member of the Ensemble-in-Residence at the Hilltown New Music Festival. Ciarán was a recipient of a prestigious Irish Research Council Scholarship, which enabled completion of his PhD thesis The (Syn)Aesthetics of Modernism: Music and Visual Art in the Early Twentieth Century (Lambert Academic Publishing, 2011). He has worked as an external examiner for Griffith College Dublin, DKIT, Pulse College and the Royal Irish Academy of Music. He has contributed to academic conferences in Ireland, the UK and the United States, and has published articles on the composers Erik Satie, György Ligeti and Bernard Herrmann. He has been a guest speaker on national radio and has presented The Lyric Concert on Lyric FM. Ciaran Nagle (vocals) and Tara Novak (vocals, violin/fiddle) have been performing together since they met in 2005 on a bus at the beginning of a Christmas tour with Ciaran’s show, the Three Irish Tenors. Sharing both a passion for Irish music and for the art of entertainment, they soon after decided to develop a duo show - one which would allow for more in-depth exploration of Irish and folk repertoire, as well as providing an opportunity to showcase their vocal harmonies, Tara’s up-beat arrangements of Irish instrumental music, and new compositions written by the pair of them. | Click here to read Ciarán Nagle's full bio. Ciarán's first real interest in singing began when he was ten, when he played the lead role in a school production of the Gypsy Baron. From that moment, singing and music have always been his passion. Ciarán trained in the College of Music Dublin and the Royal Academy of Music Dublin. He became a member of the National Chamber Choir of Ireland, and under the baton of Sir Robert Shaw, he performed at NYC's Carnegie Hall in productions of Haydn's "Creation" and "Seasons". Ciarán worked extensively with Opera Ireland before being cast as the lead singer of the international sensation Riverdance, with whom he toured for two years, after which he returned to Dublin to found the Three Irish Tenors. | Click here to read Tara Novak's full bio. 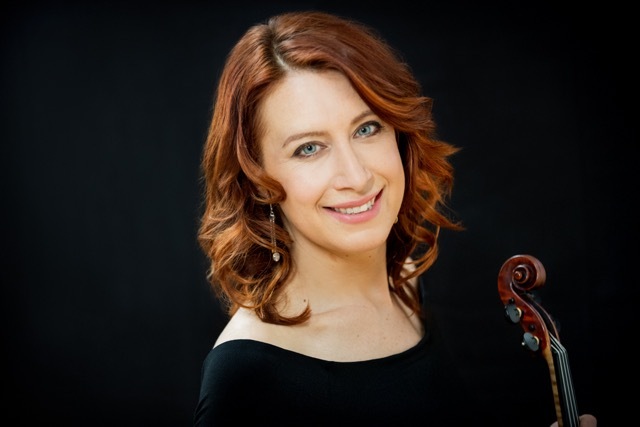 Although trained classically at the UMKC Conservatory, violinist, vocalist and composer/arranger Tara Novak has devoted the past 15 years of her life to studying music of many genres, specializing in Irish traditional music, jazz, musical theatre, and classical crossover. Since 2007, Tara has been dividing her time between Ireland and the USA, completing a degree in orchestration and jazz performance at Berklee College of Music in between tours. She works extensively as a soloist, touring China for three months in 2015 as solo violinist for Heartbeat of Home, the new show from the producers of Riverdance. In 2013, she performed the Boston premiere of Bill Whelan’s double concerto Inishlacken with fiddler Zoe Conway. She is the guest soloist with both the Three Irish Tenors and Druid, as well as music-directing and leading her own shows, Ishna and Nollaig: An Irish Christmas, and has toured throughout Europe, North America, the Caribbean, and Asia. When not on the road, Tara can frequently be found playing for Broadway musicals: recent credits include If/Then, Sound of Music, Beauty & The Beast, Newsies, Motown the Musical, Finding Neverland, and The Lion King. She considers herself lucky to have shared the stage with some of the world’s greatest artists: Stevie Wonder, Rod Stewart, il Divo, Bill Bailey, Mannheim Steamroller, and more. In addition to her busy performance schedule, Tara is also an active educator, recording artist, composer, and consultant – and an avid foodie in any time off she can find! Ishna is the name of the band that accompanies Ciaran and Tara (instruments include: guitar, mandolin, Irish whistles, uilleann bagpipes, bodhran drum, and percussion). The members of Ishna have performed for Riverdance, won Grammys, recorded hundreds of albums with other groups, and are truly some of the best musicians in the world. Ishna is an anglicized spelling of the ancient Irish name “Uisneach”, from the tale “Deirdre and the Sons of Uisneach”. Programs are subject to change. Tickets are nonrefundable. Group rates are available. Children age 5+ are welcome. Exchanges can be made up to 24 hours before the originally scheduled concert date. Please call for availability. Online ticket sales are available until 12 pm on the day of the concert. The box office at the concert venue opens one and a half hours before the concert.